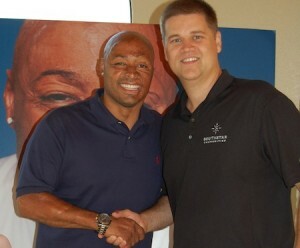 Vintage Oaks Welcomes J.R. Martinez! J.R. Martinez, the Army veteran who rose to the spotlight after winning Dancing With the Stars Season 13, plans to build his dream home in Vintage Oaks. Martinez recently purchased two homesites in one of the community’s gated neighborhoods and hopes to begin building soon. Martinez was welcomed to Vintage Oaks by his new neighbors June 23 during a book signing event for his new book, “Full of Heart.” More than 150 neighbors and fans attended the event, which raised money for Operation FINALLY HOME, who has built two mortgage-free homes for wounded veterans in Vintage Oaks as well as over 40 more across the United States. In March of 2003, J.R. was deployed to Iraq, and on April 5, less than a month into his deployment, he was driving a Humvee in Karbala, when his left front tire hit a roadside bomb. The three other soldiers were ejected from the burning vehicle, but he was trapped inside and suffered smoke inhalation and severe burns to 34 percent of his body. J.R. claims that while he was fighting for his life and awaiting medical help his sister, Anabel, appeared to him giving him the strength to live. J.R. was evacuated to a local medic station in Iraq and then to Landstuhl, Germany, for immediate care. He spent 34 months in recovery surgery at Brooke Army Medical Center (BAMC) in San Antonio, Texas, and underwent 33 different surgeries including skin grafts and cosmetic surgery. During recovery, a nurse asked him to speak to a burn patient, who had just seen his body for the first time and had become withdrawn. After a 45-minute visit, the patient opened the curtain letting light in his room and his heart. J.R. then understood the impact he had on this patient and decided to use his experience to help others. He continued to visit patients sharing his story and listening to theirs. The past two years have been quite something; not only did he and his dance partner, Karina Smirnoff, take ABC’s “Dancing With The Stars” season 13 coveted mirror ball trophy, he served as the 2012 Tournament of Roses Grand Marshal. J. R. was the cover of People Magazine, featured in their Sexiest Man Alive issue and one of the magazine’s 25 Most Intriguing People of 2011. Many awards and honors have been bestowed upon him including: Unsung Hero Award at the Lady in Red Gala; An Ivy Award for his work on behalf of the disabled in the entertainment community; recognized by the Los Angeles City Council for his dedication and passion to serving and inspiring those around him and the 2012 National Red Cross Spirit Award. He was the recipient of the 2012 National Disabled American Veteran of the Year Award and he also received the 2012 California DAV of the Year Award. He was honored to introduce Dr. Jill Biden at the January 19 2013 “Kids’ Inaugural: Our Children. Our Future.” concert. The star studded event was attended by active and retired military members and their families. J.R was featured on Katie Couric’s 2011 ABC Special “The Year,” and narrated the CNN documentary series,”In America: Vets Wanted?” Talk show guestings include: “Access Live,” “Entertainment Tonight,” “The Oprah Winfrey Show,” “60 Minutes,” “Ellen,” “The View,” “Good Morning America,” “Dr. Oz,” CNN, FOX News and Univision. He has been featured in the Los Angeles Times, The Washington Post, The New York Times, Guidepost, Success, Salute, U.S. Veterans and DAV Magazines.